Currently I have two books for sale. While I would love for everyone to buy them, you really might want to check out the free stuff on the right first. The answers you are looking for could well be there. If you know that you need a simple adjustment you can learn about Self Adjusting Technique where you’ll find out about how easy it is to do gentle adjustments on yourself. It really is easy to adjust your back, neck, hips and ribs, I guarantee it! 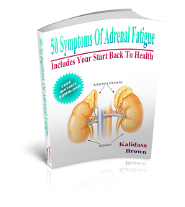 Adrenal fatigue is one of the most common conditions there is today. Unfortunately, most doctors know little or nothing about this condition. Find out about adrenal fatigue and how to be cured from it in Adrenal Fatigue, Get Your Life Back. The psoas muscle is the deepest muscle in the body. It is the most core muscle there is, and it is the main one that is targeted in Pilates work. Stretching the psoas is fairly easy once you know the poses and techniques that are included in Yoga for the Psoas.